Also in spring, grade 2 student Nathan Liu attended the 39th Annual CalChess Scholastic Super State Championship at the Santa Clara Convention Center. This is the largest state event with hundreds of players from all over California. Liu won fifth place out of 100 players in the K-3 group. He also helped Harker to win a trophy in a group competition. Soham Khan, grade 9, participated in the Music Teachers’ Association of California Composers Today state competition in late May, winning third place in his division. He will perform the piece, titled “Sonata in G Minor,” at the MTAC convention on June 30 in Los Angeles. Meanwhile, Shafieen Ibrahim, grade 7, participated in the 2014 Chicago Open Chess Tournament over Memorial Day weekend. He tied for first place in his section, earning $1,000 in prize money. Ibrahim won the No. 1 standing through tie-break points, with some 86 players in his section. In June, he participated in the 2014 North American Youth Chess Championship in New York. The venue rotates each year between the United States, Canada and Mexico, with top players competing from all over the world. While there, he tied for eighth place in his section. 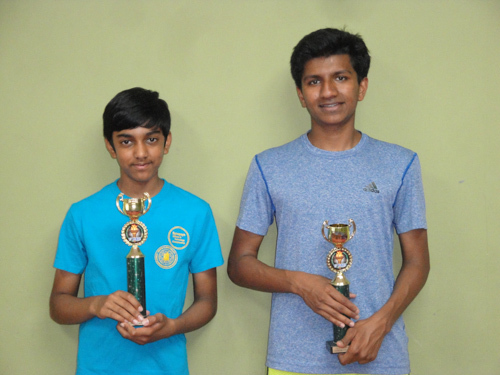 In June, the Fremont Table Tennis Academy completed its 2014 Bay Area Inter-schools League season, during which the Harker team of recent graduate Avinash Nayak and Kaushik Shivakumar, grade 7, won first place in Division I. Team Harker ended the regular season of round-robin competition by placing fourth in their division. In the playoffs, Team Harker defeated Horner, the division leader, in the semifinals with a match score of 3-2. In the final, Harker prevailed over Parkmont, with a match score of 3-2. After being Division I runners-up at the 2013 Bay Area Inter-schools League, Team Harker was happy to get to the top position this year. For the second year in a row, Nayak won all of his singles matches and was named the league MVP. Submitted by Harker parent Narendra Nayak (Avinash ’14).